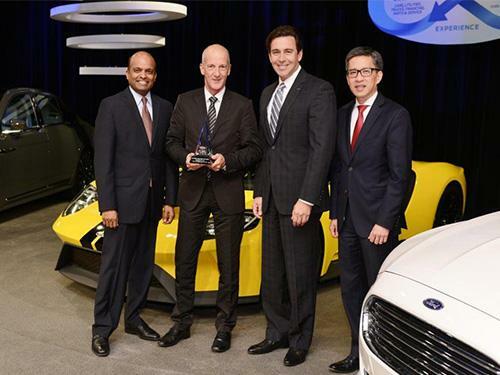 DEARBORN, Mich., May 20, 2016 – Ford honored Kautex Textron, (Kautex) as a top-performing global supplier at its 18th annual World Excellence Awards. Kautex was presented with a Green by Hau Thai-Tang, Ford Motor Company group vice president, global purchasing. Fifty-seven awards were presented to suppliers who exceed company expectations and distinguish themselves from their peers by achieving the highest levels of global excellence in 11 categories. Ford Motor Company is a global automotive and mobility company based in Dearborn, Michigan. With about 201,000 employees and 67 plants worldwide, the company’s core business includes designing, manufacturing, marketing, financing and servicing a full line of Ford cars, trucks, SUVs and electrified vehicles, as well as Lincoln luxury vehicles. At the same time, Ford is aggressively pursuing emerging opportunities through Ford Smart Mobility, the company’s plan to be a leader in connectivity, mobility, autonomous vehicles, the customer experience, and data and analytics. For more information regarding Ford, its products worldwide or Ford Motor Credit Company, visit www.corporate.ford.com. Kautex, a subsidiary of Textron Inc., is rated among the Top 100 Automotive Suppliers worldwide. The company is a leading global supplier of plastic fuel systems solutions, selective catalytic reduction systems (SCR), camshafts and camera and sensor cleaning solutions. The company also produces plastic packaging meeting numerous industry standards, including agricultural, pharmaceutical and chemical. Headquartered in Bonn, Germany, the company operates 32 plants in 17 countries worldwide.